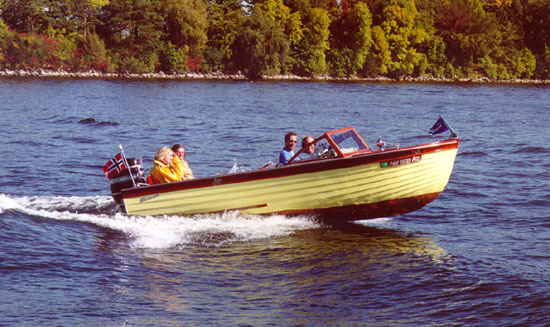 Andreas Jordahl Rhude on Lake Minnetonka in Minnesota at the helm in his 1957 Thompson Sea Lancer. A new boat for 1957, she measures 16'7" and became Thompsons' best seller. Andreas has two 1957, 35 horse Johnsons that he is currently restoring for the boat. Until then, the 110 horse Mercury will have to do! In the boat are members of the Keating family. Mary Keating is in the rear seat. She is the sister of Bob Speltz, who wrote The Real Runabouts series of books.